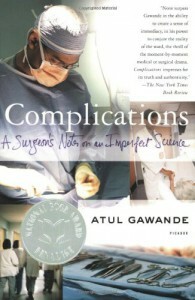 Complications: A Surgeon's Notes on an Imperfect Science - Atul Gawande - review - So.... Nicky? Listened to this while on a long-haul drive, and was mesmerized. Had to turn off the recording at the end of chapters to think about things: How should surgeons gain their skills, who should decide what care I should get, whether that scratch on my foot is infected with flesh-eating bacteria. Very clear writing and great stories--his and those of his patients.